Celebrities hunt for antiques across the UK. Award-winning poets Benjamin Zephaniah and Roger McGough OBE FRSL are the celebrity guests hunting for antique treasure. Browse content similar to Benjamin Zephaniah and Roger McGough. Check below for episodes and series from the same categories and more! -All breakages must be paid for! BANGS GAVEL But it's no easy ride. old pals Benjamin Zephaniah and Roger McGough. Have you prepared? Have you googled things like...? No, I haven't done anything like that. and I thought... You don't really have to do anything. ..sell them. I'm going to win, you're going to lose. -End of programme, that's it! but my trouble with being a runner, I didn't like overtaking people. -I always thought it a bit rude. "I'll let them win cos obviously, they really want to." as a member of the 1960s chart-topping band The Scaffold. He's the one on the right! cultural icons like Bob Dylan, Jimi Hendrix and The Beatles. running radio poetry show, Poetry Please, on Radio 4.
especially read by Stevie herself. went to, I don't know if you had books at home. I didn't. members that I really wanted to be a poet, it was, "Get a job, man!" "Name a writer that you know that's earning money." And I went, "Bill." She went, "Bill who?" I went, "Bill Shakespeare." She went, "Him dead long time! "And you are dead too if you go on with this writing business!" So, nobody encouraged me really. -And every turkey has a mum. Benjamin is also a fierce campaigner for both human and animal rights. And is an ambassador of the Vegan Society. road in this classy 1978 Rolls Royce Silver Shadow. I love classic cars. I go to classic car shows, just to look at cars. I watch the programmes. I made my own car. Yeah, I took a chassis from an old Triumph and just rebuilt it. Not in a typical Triumph way. -I put Ferrari bits in it, so it's a hybrid. If cars could have children, you'd have a car like mine. I call it a mixed race car. Natasha Raskin and Philip Serrell. Who are we going to work with today then? I sort of have a preference, in a way, I've got to tell you that. -You have a preference? OK, hit me. -He was in Scaffold and I used to love Lily The Pink. -What about you and Benjamin? -Oh, I'm a bit of a Benjamin Zephaniah fan. Yet in such a polite way. He's never rude or abrasive, but he can be controversial. starting their journey in Kettering, Northamptonshire. before finishing up at an auction in Leicester. You must be Phil, hello. -How are you? Roger, good to see you. -It's so lovely to meet you. You're Philip, how are you, my friend? Good to see you. -Oh, do I get a kiss now? -Nice to meet you, how are you? It is the only way to travel, isn't it? We'd better go and buy something, hadn't we? -I know. We've already decided who we want to go with. -No, no, no. Well, we'd better go, hadn't we? Time to hit the road, chaps. -Do you want to drive? -I will try my best. You too. And it is only antiques. Yeah, it's only a game. -I'll get you, Roger McGough. Roger and Philip are making their way to Higham Ferrers. Have you never been a driver? What's funny is so many poets don't drive. -Am I going to hear it? -You may, if you're good. If you promise to be good. ..about why I don't drive. It is called Repelled By Metal. -No, I will, I will, I will. "I don't drive I'm afraid. "Never had the inclination or the need. "I'm repelled by metal and unimpressed by speed. "Nor am I being holier than thou. "Without your lift I'd be stranded. "It's just that I know my limitations. "I'd be all thumbs behind a wheel. "Could you park a poem in a space this small? "Well, that's how I feel." What a great way to kick off the trip. The shop is somewhere around here, isn't it? have arrived at Higham Antiques. How will Roger cope in the world of antiques? -We need a plan, don't we, really? -How many things should we buy, do you think? I mean, I think this is a good shop, there's good things in here. and if we could buy three, that would be better still. And it looks like Phil's beady eye has already spotted something. You don't need to open this to know what this is. This dates... This is 18th-century, it is Georgian, mahogany. and they put divisions in there for stationery boxes. -So, there you are, look. But what I love about this is, it's a great social history. This is Downton Abbey stuff, you know. and this would have sat with its cutlery in there. Ten years ago, this was, like, £300. -And if it was with the original interior, it is over £500. But today, it is stuff. Who wants stuff? cos they don't want this cluttering up their homes. -It's good for putting stuff in though, isn't it? Could you write a... Could we write a poem? -What do you think to that? I like it, you have talked me into that. Yes. It is light and it's... How much is it worth? -..and make a parcel of things. OK? Don't let anybody buy that, please, before we come back. Could I have a look at that one, please? Omega. Good make, isn't it? -It is a good make, isn't it? Omega. It doesn't look like my idea of an Omega. it is stainless and it is priced at £55. -with that stainless steel case. -Do you like that or not? People buy these, people collect them, do they? Do you minding putting it over there, please? Sounds like the luxury Swiss watch is a possible. but this is probably on the sideboard. -Is it silver? Is it silver something? Very light. Very light. I always think silver's going to be heavy. The early 20th century Bachelor's Tea Set is priced at £165. but, that is a real yesterday's antique. So you've got to get that at half price if you get it. -But that might be an option. Do you like it? I think people would like it. -Shall we put it in the pile? -Shall we do that then? Then probably, we can make our decision, shall we? Yeah? -Do you think it is time to..? -Really? I could see that. The collective ticket price is £310 for their three finds. taking the total down to 220. -Can I squeeze you to 200 and we'll definitely take them? -Thank you very, very much, you've been a star. -You've been ever so helpful, thank you. That's a very generous £110 off the combined ticket price. stop of the day, in Northampton. And then eventually you got to go on and perform with the Wailers? That must have been a crazy experience! -we did a recording together. a tribute to Nelson Mandela, actually. And this led to an introduction with Mandela, is that correct? when Mandela came out of prison, he asked to meet me. -he always wore these bright shirts. it was all grey, he didn't see much colour. you know, "Your shirts are a bit bland, Benjamin." had to take him away. this is six years later, "Benjamin, you're still wearing boring shirts!" I thought, "My gosh! He remembers me and he remembers the conversation!" Gosh, what an amazing memory to have! Ha! We could be transported to another dimension! -Yes, we could, we might have to be! After you. -This is quite impressive, isn't it? I like the traffic lights. almost 50 traders selling everything from collectables to retro items. divvied up into little bits and bobs. Shall we just delve into each little area and see what we can find? so, you're really going to have to guide me. -So, you don't go antiquing? Not even when you're in China and all these places, looking around...? interesting, but, um, I don't take time out to go in and look around. -OK! Well, let's do it. -After you, let's go in here. -There is a Hoover there with your name on it! -You want me to do the hoovering? -Yes, please, if you wouldn't mind! A plethora to choose from in here! -I'm out to get Roger McGough, this is important to me. -It's important to you, is it? -Oh, but Benjamin, it's just a game! Sounds like Benjamin means business! Ooh, what have you spotted? -The scales are quite good fun. the worst title of all time! But people are quite into that. -OK, shall we have a closer look? OK, so these are shop scales, actually. in fact I remember that name when I was a kid. You know, the local shopkeepers had scales like this, with the weights. -OK, I can see the price, I don't think you could see it. -So, tell me what you reckon it's worth. -Well, £50 is the price tag, which is all right. I think that's a really nice spot. Time to call in the dealer, perhaps. Oh, hang on, Natasha's onto something. Oops! Well, here we are. had something like this, for sort of recording your early poetry. -I did, something quite similar. I mean, that looks pretty retro to me. I reckon you could easily get £10 back for this at auction. you could maybe even get £20 or £30 for it. So, I don't know about you, but I like it and I think you like it too. What I like is that this is also from the same dealer as the scales. -and make ourselves a wee profit. -I love what you're saying! Yes! -Then when it all goes wrong, we can listen to Ultravox! Come on, this is... This is a find, this is an absolute find. OK, I'm going to pop it in. I'm glad you like it. Oof! -I smell a deal coming! You smell a deal? Oh, good! is there a deal to be done with Jackie? So, obviously we want to get them at the best price possible. it would be quite good to shave some off, but that's a kind of safe bet. the auction estimate will probably be £20-£40 or so, I reckon. -What were you thinking of offering? -Well, could we have, like, both for 30? -Nice and simple, isn't it? -I'm in love with you! Because that's the figure I had in my head when you were talking! Really? That's great, Jackie, thank you very much. First two lots bought for £30, hurrah! She's positively giddy, that girl! behind the car that they are driving. which changed the face of British history. the director of the Henry Royce Foundation, Philip Hall. the engineer, the creative one, is there any truth in that? but they were both a bit of each. -at the age of 40. -And what was he doing before cars? Well, his first job, he was selling newspapers for WH Smith. he was an apprentice to the Great Northern Railway in Peterborough. So, engineering was in his blood. How did they meet one another? so, he built three prototype cars, Royce cars. a British car good enough for his own exacting standards. The two were soon introduced and they founded their now famous company. they quickly became known for making the best cars in the world. by Charles Sykes on the bonnet, but how did that come about? many motorists were fitting sort of rather trashy mascots to their cars. with a nice mascot, they'll use that. and he came up with what is now known as the Spirit of Ecstasy. enter into the aviation business, designing engines for planes. and years later, he designed the ground-breaking Merlin engine. it would make to the world. Rolls-Royce's Merlin engine powered pretty well all the Allied aircraft. of the Second World War could have been very, very different indeed. If you could sum up his legacy in a short sentence, what would it be? His legacy is perhaps the greatest name in engineering in the world. of course, it is perhaps the most famous name in the world. and have made their way to Weedon Bec in Northamptonshire. They are heading for Shires Antiques. Right, Benjamin, we've got money to burn here. -£400 and we've only spent 30. -And whose fault is that? -Your negotiating was too good! -Let's see if we can spend some of this cash. -Now, this is the real deal! -The real deal, this is it! this place is bursting with potential purchases. ..we've got a good pot, so, we might as well spend some. It would be nice if we could afford that chaise longue, wouldn't it? I mean, it's only a mere £800. -Is anything jumping out at you? There must be something in here for our poet! it's a beautifully crafted thing, just looking at it. A sextant was used for navigation back in the day. Have you got an interest in marine items in general? Um, no, I'm actually really scared of the sea! -You're really scared of the sea? -I can't swim or anything. -Do you want to have a look at it out of the cabinet? I think if we ask nicely, that should be fine. Better call Alison over, then. So, first thing we want to do is look for a maker, and there is one. -And with what do you associate Stanley? So, a maker of sort of hardware and things like that. So, it's Stanley London, so it's a big brand item. But when we see Stanley, I think we also probably think mass-produced. So, it's not necessarily the world's most finely produced sextant. What kind of age do you reckon that would be? Sort of 1930s, '40s? -I would have thought that was about right. but we're not talking latter half. Do you want to have a feel of it, feel the weight of it? -Just don't drop it, Benjamin! What do you see? Do you see a profit, Benjamin? I see a television audience. Do they look as terrified as you do? They're all sitting at home going, "It's that mad poet!" Can we knock the price down a bit? -The dealer's trade price on that is 45. -I can't see them taking any less. -I want to take this. -You want to go for it? Show me your hand. Thank you very much. And that wraps up a perfectly poetic first day of shopping. Nighty-night, chaps. May all your couplets be rhyming. and gearing up for the day ahead. Have you got a lot to do? as they say in America, a high ticket item. What were you like at bargaining? Actually... I was very persuasive. I thought you might have been, actually. Oh... I mean, I wasn't going to say charm. -Roger, I'll blow you a kiss. -They're nervous, I can see it. Quite rightly, you should be. You should be nervous. -We're just going to... steal the march on you. -Do you want to continue driving? which leaves them £200 available to spend. leaving them with £325 to play with. Back on the road, both teams are heading for Heanor in Derbyshire. Is it important for you to beat Roger? I mean... I don't hesitate at all to say that. He's a dear friend and everything but I'm very competitive. You know, I'm quite happy with that. Benjamin and Natasha are first to arrive. -We better get the good stuff before them. -Actually, that's a good plan. But that Phil, he always spots something that I miss, I tell you. -We've got to get in before him. -You can be my second pair of eyes. Benjamin has proved to be jolly good at this antique lark so far. Mind you, blink and you could miss a gem in here, look! Cor! in the corner, because there's stuff everywhere. We'd better catch them up. But Benjamin and the Tasha are already in the thick of it. There are a couple that I really like. -where you can see the pendulum sort of wagging like a tail. But the one underneath it is also really nice, too. -I thought you were going to point that one out. I'm not so much into the pomp of the bottom one. Slate, black slate, so highly polished and decorated. -doesn't that make you think of the beautiful building? You're quite keen on that? You like the look of it? I do like it. Is it damaged or something? Can you see the white bit at the top right? Yeah, shall we go and have a closer look? Maybe it's just a natural colour of the stone or maybe it is a chip. I'm thinking about this bit here. Oh, no, it is just part of the mottled sort of marble, isn't it? -I mean, what do you think about it, looking at it close up? It's at 185 just now, ticket price. we've got a little bit of hope and we'll have spent a big bit of money. Right. I think... this is it. -You're quite keen on it? -Yes, I am, I really am. Benjamin is smitten. Dave will reveal how low the clock dealer will go. I don't want to look. I don't want to look. Er, he's got trade 20 on this, so that's 165. -Sharp intake of breath, that's pretty normal. that's what I'm thinking of! that could be placed upon the clock. -and see where we can go for you. -Shall we keep looking, then, in those five minutes? Time is of the essence, I guess. So let's do it. Fingers crossed, then, fingers crossed. My fingers, they are well crossed. What are Philip and Roger up to? into town, we used to pass all of these streets. because all the streets were named after poets. I love that, just for those reasons. -That's been there, hasn't it? That looks like it could be a good find, Roger. I'm a poet, you see? We think this is really lovely here and it's an old one, isn't it? It is, yeah. That's definitely an original. We love this at sort of 40, £45, if you can do it. If you can, you can. If you can't, you can't. After a quick call to the owner, Dave's back with a decision. I'll go in another tenner and that's as far as I dare go. -I think so as well. -We'll settle for that, shall we? £40 seals the deal for the very fitting sign. Now, what of their rivals? -You love to engage with children. -What's this building up to? ..we've got a whole variety of your friends. It doesn't have a price on it. because I think it's actually just really cool. -and, as a children's author, I hope it has some appeal to you, too. and it's got also a little bit of educational appeal to it. OK, let's find out the price. Right, Dave, what's the damage for dealer Jane's ark? We don't know how highly Jane thinks of it, because we can't see a price. -So I didn't actually believe that. Is Jane worth giving a wee call? Oh. I saw the 100 on it. I genuinely thought that wasn't anything to do. Because all the other ones have a pound sign in front of them. And that didn't look like a price to me. Biggest discount I've ever given, call it a tenner. -I think she did miss a decimal point, don't you? -Before he changes his mind. So, we'll say yes to £10 for that. -Now, can we have the same discount, please, on the clock! I can't get hold of Peter. He's not replying. So, we're at 165, and you wanted to come in where? I like your dreadlocks and everything, man, it's cool. You've got to have fun, man, show me your hand. and Dave's generosity lands them the ark and the clock. and has taken him to Ravenshead. -which was the ancestral home of Lord Byron. so I'm so glad you've brought me here. after inheriting this ancestral home from his uncle. have you been on other such journeys? -for a couple of years. And I've been down to Bournemouth to Mary Shelley's grave. -She wrote Frankenstein, of course. cos he's buried all over the world. Yeah. It's kind of part inspiration. where they lived, where they died. there are many similarities between Byron and our Benjamin. in the early 19th century and, arguably, Britain's first celebrity. who, like Byron, experienced a rapid rise to fame. -and nobody knew me outside Birmingham. Nice place to be big. Then, I came down to London. a lot of creative people. With the term, the alternative, comedy scene, things like that. "The next time you see me, it'll be on television." And I thought it would take five years or so. But, within a year or so, I was on television. -is that he was mad, bad and dangerous to know. And I wonder, Benjamin, does that apply to you? It has been said that I'm mad, bad and dangerous to know. But my mum just says I'm a naughty boy! almost as famous for his scandalous private life as his poetry. Benjamin's work often focuses on his passions, including inequality. We try and tell them poetry is a good way of expressing yourself. You know, I was friends with Nelson Mandela. about what was going on in South Africa. There's similar situations going on around the world now. And we want to use our voice. So, my work is not done yet. I was going to say angrier. We just get more passionate, you know. Like Benjamin, Byron, too, was an avid supporter of liberal causes. He settled in Italy, and joined Greece in their war of independence. But sadly died of fever during the struggle, aged just 36. -wreaking havoc in the shires. Shall we go and see what he's been up to? I really want to know what he's been up to. So, yeah, we should go. And, what of their rivals? Roger and Philip have made their way to Nottingham. and it's where our boys are hoping to find some last-minute bargains. -They're definitely, yeah, they're definitely you. Do these things sell? Old record players and stuff? They can do. Because everybody's now playing vinyl. -But it's a bit of a specialist area. I remember my old Celestion speakers. -Yeah. Is that good or bad? -Before my time, weren't they? Close-run thing. Old typewriter, look. Old typewriter, ah. Can we look for a typewriter? These are all a bit modern. I'd like something a bit older, if I can. I thought I thought they went well, typewriters sold well? -it's a little bit more decorative, isn't it? And it's certainly old, I think. -Why do you like that, then, Rog? Well, I like it because it works, it has a nice action. And I can imagine DH Lawrence. -It's quite a cool thing, isn't it? vanished off the face of the Earth. -You know, all the technology. -I never used one myself. I had an Italian Olivetti. I think my mum bought me one when I was very young. But I never sort of used it. -It's almost a piece of sculpture. Shall we find out what our good lady could do it for? We're quite taken with your typewriter. Right, then, that's £38. Let's see. between £20 and £35, something like that. Which means we've got to try and buy it below that, if we can. Could you try a bit harder for us? -If we give you £25 for it, would that be a deal? -I'm sorry, you want the money, don't you! I think we'll pass, Philip, eh? That final purchase means our poets are all bought up. Time to get together for a bit of show and tell. And, who knows, perhaps poetic licence? -So, shall we show them what we've got? With me, Benjamin, towards me, here we go! -It's a heady mix. It's a mix, isn't it? -Ah! The Dolby system when it first came out. at the end of the '80s, going for it with his mic input tape deck. -I can see that, yeah. -So, how much was that? -Benjamin got it for half-price, £5 only. -Yeah, they liked my charm! -This stuff is quite trendy now. -And you still got it for a fiver! What about the shop scales? Well, these made you nostalgic, didn't they? Yeah, they did. I remember going into shops, and they were there. -Oh, Avery, of course. Indeed. And, I think we can make a weighty profit! We'll have to "weight" and see! Oh! -Let's hope it doesn't "weigh" too heavy on you. -And, the old Noah's ark, yes? -Very, very collectible, Noah's arks, aren't they? -Do you want to see some quality items now? -Yes, I'm looking at it. -Come on, let's have a look. Reveal yourselves. On the count of three. One, two, three, go! What have you got here? Oh! And then, there was our cutlery box which hasn't got the interior. But we just thought that, that's a proper antique, isn't it? It's properly lovely, yeah, I love this shell design here. You see on it on everything. The trays, these boxes, the tea caddies. -I think that's our best bit. -OK, so, wristwatch. Oh, it's an Omega! I wouldn't have seen that as being so valuable. -How much did they pay for it. -40 quid! For an Omega wristwatch! For the price of nothing, really. And it works. -I'm not happy with that. Could you just repeat that one more time for me? Hold on? Benjamin, don't say it, don't say it. Just come with me! The nation doesn't want to hear it. Come on. Well done. what did they really make of each other's lots? What's your favourite piece on their table? -I do like the Tennyson Street sign. -Yeah. How did we miss that? -You know, that was in the shop we were all in. They're such monkeys, they're so cheeky. I think they can't lose much money on the tape deck. They can't lose much money on the scales. They can't lose much money on the sextant, or the Noah's ark. I must say, I liked what they had. I think they could lose money on the clock. I can see that perhaps costing them 50 quid. -I like typewriters, of course. I've not really seen one making in excess of £20-30 at auction. So, we're quite safe there, I think. If I was a bookie, I think the odds are a bit in our favour. and are now motoring towards Leicester for the big finale. So, how are you feeling about today going forward? Well, it will be interesting to see how we go. I mean, Phil was great. -And Natasha was as well. Directing you towards things, and that. Which I enjoyed. But I'd no idea how much things were worth. -Well, we can't do anything now, really. -No, exactly. Let it happen. Yep. Today, they'll be doing battle at Churchgate Auctions. -I'm looking forward to it actually. -Well, we'd better go and see what happens, hadn't we? -I think I know what's going to happen. Madness is going to ensue! The man with the gavel today is Dickon Dearman. So, what does he make of our lots and lots? is the 1950s Omega stainless steel wristwatch. it's a nice mixture of old and new items. There might well be some surprises in that lot in the sale today. Roger and Philip spent £265 on five auction lots. While Benjamin and Natasha spent less, buying five lots for £215. Right. They're taking their seats, as the auction is about to begin. Your first auction. It's all go. First up, it's Roger's spot. Start me at £20? £20 for that nice typewriter? Any interest at 20? £10 if you like, then. £10 being bid. 12. 14. 16. 18. £20. -£30. £30. 30 just there. 32. 32 now. 32. Do I see any further bids? At 32, he's back in. £35 now. 35 is there now? 35 anywhere? -Oh, you guys are in profit. 37. 37, no. Selling them for £35. I was wanting more, I wanted more. I wanted double, almost 50. Nothing wrong with aiming high, Roger. Up next, it's Benjamin and Natasha's Audiotronics tape deck. -How do you think our tape deck's going to go? -Oh, well, I don't know. But I'm going nervous, suddenly. £20. £20? A tenner then, if you like, for it. £10. -£10 is being bid in the corner there. -Do I see a 12 now? £12. 12, do I see a 12? Is there anywhere a 12. 14. 14. 16. 16 just there. 18. Yes, £18. 20. -Go with the flow, go with the flow. Selling, then, for £18. Thank you, madam. That puts you ahead in the profit margins so far. He's in the groove, isn't he? A perfect start for Benjamin and Natasha. Great stuff. Now, it's the auctioneer's tip for the top. Roger and Philip's Omega wristwatch. you can just see how long you've got. If you do it like that, it's a bit aggressive, isn't it? £50 on the watch, sir. £50. Have you bid? 55. 45, they're already in profit. 105, now. 105, fresh bid at 105. -110. 110 now. 110 now. 110. He's cool now, isn't he? 140 do I see now? 140 do I see? -No, selling then to you, sir, for 135. That smashing result sees Roger and Philip romp into the lead. Phil said, "Roger, why are you buying that for?" I said, "It's going to raise money." He said, "Please don't." I said, "Phil, trust me on this one," didn't I? I said, "Trust me on this one." I implored him not to buy it, right? And I was wrong! They're like a comedy duo, those two. Benjamin and Natasha are playing catch-up with their brass sextant. -This was your spot, you know. Do I see £30? Any interest at 30? £20 only, then, for it? £20 for the sextant. -It's worth £20, surely, now? Oh, £20 on the front, thank you. £20 being bid. 22. 28. 28. £30. 32. 34. 34 now. Oh, no. Oh, no, no. Keep going, keep going. 34 back in. 36. 36. 38. All done, selling down here, then, for £36. -Oh, it's a loss, it's a loss! Mm. Clearly, no marine enthusiasts in the room today. Could be because it's not old. -It's only a game, it's only a game. -No, it's not a game. You say it's only a game because you're winning. We're trying to be magnanimous about this. with the Georgian mahogany cutlery box? Benjamin, what if it makes over 100 quid? If it makes over 100 quid, I think we could just go home now. Shall we just storm out? £50? Any interest at 50. £40, if you like, then. £40 has been bid. Thank you. Do I see 45 now? 45. 45, is there anywhere a 45? 65. £70 now. £70. 70 just there. 75. 75 is there anywhere? 75 do I see? -Is it going to break even? -Any further bids? Selling then for £70. After auction costs, that will be a small loss. But, fear not, Roger and Philip, you're still in the lead. The scales are up next, Benjamin. The scales fell from her eyes, and bruised her toes. Are you acting like a poet? -I wasn't expecting such profundity. I just got a bit of a fright there, Roger, actually. Well, let's hope your set of Avery scales don't give you another one. £10, any interest at 10? £10 has been bid, thank you, sir. -Do I see 12 now? Do I see 12. Is there a 12, madam? 14. 16. 18. 18. £20. 22, is there anywhere 22 do I see? No further bids. Never mind. Benjamin loved them. We went out and bought things that would gain a profit, you see. -And we bought things we liked. I like your attitude, Benjamin. Time now for the three-piece silver tea set. £50, any interest at 50? £30 if you like, then. £30, thank you, £30 has been bid on this. Do I see 32 now? £50. 52. 55. 55. 57. Do I see £60 anywhere? 60 just there. 62. 62. 75, is there no further bids? Selling it for £70. Thank you. But Roger and Philip are still in the lead. Can Natasha and Benjamin's Noah's ark close the gap? I'm going to will it to do well. I'm going to send my vibes out to the people. £10 for the vintage Noah's ark. I've got £10 bid in the corner there. Thank you, sir. Do I see 12 now? £12. 12, madam. -Fresh bid at 26. 28. £30. 32. 34. 36. 38. 38, do I see? Any further bids? No, selling it, then, for £36. Yes, we'll take that. Good stuff. That pretty profit puts you back in the game. It's Roger and Philip's final lot. The Tennyson Street sign. £20. £20 on the front has been bid, thank you. Do I see 22 now? 22. 24. 28. 28. £30. 32. 34. 55. 55 now. 55 do I see? 55 anywhere? All done, selling then for £52. Sold. we'd have all been crying. That's great. Roger and Philip end on a high. on their priciest purchase, their mantle clock. We've put all of our eggs in this clock's basket. And here it comes. Listen, my mum's watching too. I'm nervous. -Who'll start me at £50? -Oh, 50 quid! Come on. Do I see 50? £30, if you like, then. £30 has been bid. £30 has been bid. Do I see 35 now? -Have a good look at it, everybody. 60. 65. £70 has been bid. Do I see 75 now? 75. This is nuts, this is nuts. No, Benjamin, no, it's not happening. Well, it was a risky punt. But you did love it, Benjamin. I've always wanted to really beat Roger McGough. Well, another day, another day. -On that note, let's go. We'll challenge him to a race outside, how about that? Well, while you get ready to run, let's find out the final results. Which means they're crowned today's winners, finishing with £431.84. Hurrah! And all profits go to Children In Need. Oh, no, come on, just give us the figures. Well, I'm afraid you've lost. -Oh, that's not too bad. You can say sorry, and good luck in your life, in what you do. And the best people won. Things like that. -Roger. Just play this down, Rog. Let's be humble in defeat, let's be humble in defeat. -We had fun, we had a laugh. -It's been good, hasn't it? We'd better wave you goodbye and bon voyage. -Thank you so much for being such a great sport. Thank you, it's been wonderful. So good. -Actually, Roger, I mean, we've known each other for years. -or a radio studio, or, you know, on stage. And, actually, we've hung out together for a couple of days. -I never want to see you again! -I didn't like to mention that. 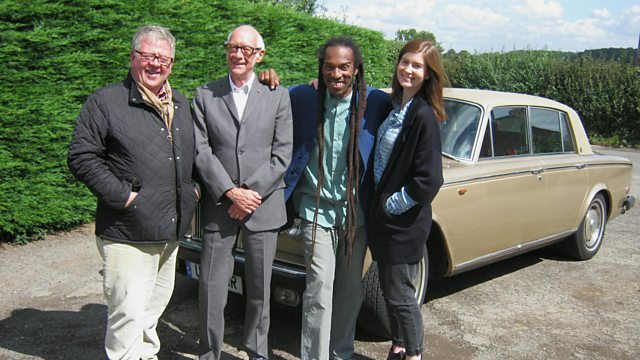 Award-winning poets Benjamin Zephaniah and Roger McGough OBE FRSL are the celebrity guests hunting for antique treasure. Their road trip takes them around Northamptonshire, Derbyshire and Nottinghamshire with the help of experts Phil Serrell and Natasha Raskin, before heading to auction in Leicester.